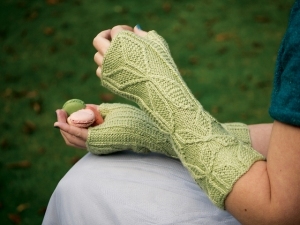 Taken from Saturday Treat by Ysolda Teague: Long fingerless mitts featuing a geometric cable pattern: a variation on a traditional pattern of tessellated diamonds arranged so their outlines form a flowing lattice. Size US 2.5 dpns (or size needed to obtain gauge) are required but not included. Finished Measurements: 7" - 8.5" around the knuckles after blocking. Gauge: 30 sts and 38 rows over 4"
Color Shown is Flying Saucer. $28.40 -- Kit price including yarn only (no book or pattern). $42.40 -- Kit price including yarn and pattern book.